The Federal Reserve moved aggressively Thursday in an effort to speed up the economic recovery – and Wall Street welcomed the stimulus infusion by sending stocks to their highest levels in almost five years. The Fed’s past two easing programs have helped buoy stocks and other asset classes, including gold, as investors sought to spend their depreciating dollars. Sure enough, stocks, gold and oil prices all soared after the central bank’s announcement. The Standard & Poor’s 500-stock index and the Dow Jones Industrial Average both surged to their highest levels since December 2007. The tech-heavy Nasdaq is at it best level since late 2000. Financial stocks like Bank of America Merrill Lynch and Citigroup led the charge following the Fed’s announcement, but the shares of homebuilders like KB Home, Lennar, PulteGroup, Toll Brothers and Hovnanian Enterprises also rallied to fresh highs for the year. As investors cheered a third round of quantitative easing, Bernanke and Co. made clear that, while they hope rising asset prices in general make people more willing to spend money, they are perhaps less focused on stocks than they are on other markets, particularly those for labor and housing. What’s less certain is whether the bold new program the central bank is undertaking will be able to significantly move the needle in those areas – and whether it will make any difference at all for middle-class Americans who owe more on their mortgages than their homes are worth. About 22 percent of U.S. homes with a mortgage – or 10.8 million properties – remained “underwater” in the second quarter of the year, tracking firm CoreLogic said last week. The Fed’s new bond-buying is aimed at bringing down already low interest rates even further. The central bank will buy $40 billion in mortgage-backed securities each month while continuing it’s so-called Operation Twist, which seeks to bring down long-term interest rates by lengthening the average maturity of the Fed’s holdings. In all, the Fed will add $85 billion in long-term securities each month through the end of 2012, and it signaled that it would keep interest rates low in 2015 and continue its extraordinary bond buying until the economy shows signs of real strength or inflation shows signs of spiking higher. The Fed said it will be measuring its success according to the job picture, though Bernanke declined to set a specific target for the unemployment rate, instead opting for a less specific – though not less lofty – goal. “If the outlook for the labor market does not improve substantially, the Committee will continue its purchases of agency mortgage-backed securities, undertake additional asset purchases, and employ its other policy tools as appropriate until such improvement is achieved in a context of price stability,” the Fed committee statement said. Economists read the Fed statement and its revised economic forecast to imply a more specific target of cutting the unemployment rate by more than a percentage point from its current 8.1 percent. “The message from their numbers is that, assuming inflation is not at issue, they will not tighten until the employment rate is at least below 7 percent,” Jim O’Sullivan of High Frequency Economics wrote in a note to clients. But Bernanke made clear at his Thursday afternoon press conference that he’ll be looking for broader improvement in the labor market – looking not only at whether the unemployment rate falls below 7 percent but whether it does so for healthy reasons. "We do want to look at a range of indicators,” Bernanke said, “not just the unemployment rate, although that's a very important indicator, not just payrolls, although that also is a leading indicator, but participation, hours, part-time work and a variety of other measures which suggest that our labor market is still in quite weak condition." The Fed can’t exert its muscle directly on the labor market – it can’t force businesses to go out and hire, it can only try to create conditions that will encourage them to do so. The hope, in part, is that further easing might lead more companies with rich stock prices and record low borrowing costs to invest in expansion and hire new workers. Before the Fed’s announcement, 47 economists polled by The Wall Street Journal said a hypothetical $500 billion bond-buying plan would boost GDP by 0.2 percent and cut unemployment by 0.1 percentage points. In other words, eh. “The primary beneficiaries of an aggressive Federal Reserve bond buying program are not America’s unemployed,” Jack Ablin of Harris Private Bank wrote before the Fed’s announcement. The unemployment rate was 8.7 percent when the Fed started its first wave of quantitative easing, Harris noted, and it hasn’t fallen all that much. But Bernanke made clear last month that he believes the Fed’s easing policies have helped, citing research that found that the $2.3 trillion in asset purchases increased private payrolls by more than 2 million jobs. The Fed can, on the other hand, exert even more pressure on mortgage rates. Its program to buy up mortgage-backed securities makes it the Washington Whale in that market. Rates on home loans are already near record lows, but there may be some room for them to go lower. PNC economists noted Thursday that the spread between the 30-year fixed mortgage rate and the 10-year Treasury rate is higher than its long-term average. Already, mortgage-backed bond prices rallied sharply after the Fed announcement, driving yields lower. Further shoring up of the housing market could remove an economic drag – and could help the Fed reach its goal of a stronger labor market. “The return of the housing market is a terrific employment stimulus,” says David Crowe, chief economist of the National Association of Home Builders, who estimates that for every 100 single-family homes built the economy adds 300 jobs (or the equivalent of 300 individual years worth of employment). Half of those jobs are in construction, but the rest are spread across manufacturing – those new homes need appliances, cabinets, carpeting, etc. – as well as architecture, banks and other areas. “It’s a wide distribution of job impacts, and it goes well beyond construction,” says Crowe, who adds that he’s optimistic about the housing market. Even if mortgage rates do edge lower due to the Fed’s new buying, though, it’s not clear how much of a broader boost that will provide. Lower mortgage rates could spur more homeowners to refinance their loans, however, allowing them to free up some extra cash every month that could then be used on other purchases. That could at least add some consumer demand to an economy that desperately needs it. But those almost 11 million underwater homeowners aren’t in a position to refinance, so they’ll need home prices to keep rising before they get their chance. The question is whether marginally lower mortgage rates can provide that sort of boost to the housing market. 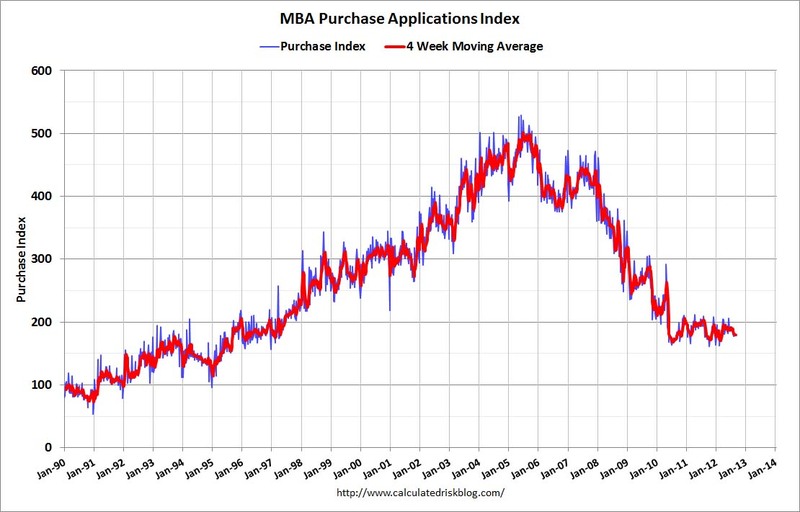 Mortgage applications haven’t rebounded strongly despite already low interest rates and stabilizing home prices. Originations for 2012 are expected to total just over $1.4 trillion in 2012, compared to just under $1.3 trillion in 2011, according to an August estimate from the Mortgage Bankers Association. And many would-be buyers are still blocked by tight credit conditions set by lenders. Bernanke himself has jawboned lawmakers about the need for them to act, and he addressed the fiscal and policy uncertainty again in his press conference Thursday afternoon. "I can certainly confirm as the reserve bank presidents and governors made their reports today and yesterday around the table, there was considerable discussion of uncertainty, including policy uncertainty, fiscal policy uncertainty and the implications of that for hiring and investment decisions." Ultimately, the Fed chairman sent a strong signal last week that he’s going to do everything he can to help the economy build momentum but he will need help. “We are looking for policymakers in other areas to do their part,” Bernanke said. “We will do our part and we will try to make sure that unemployment moves in the right direction, but we can't solve this problem by ourselves."